Mysteries of Ancient History : What Did Atlantis Look Like? When it comes to mysteries of ancient history, the actual appearance of Atlantis is considered to be one of the most intriguing. While many people wonder if the continent really did exist, others wonder what Atlantis looked like. Unfortunately we only have a few resources on this subject. The most popular and most used version comes from three playlets written by the great philosopher Plato, approximately 428 to 348 B.C. He was a student of Socrates, another great Greek philosopher. These three playlets were called “The Republic”, “Timaeus”, and “Critias”, which Plato wrote around 355 to 360 B. C.
Plato’s example placed Atlantis beyond the great pillars of Gibraltar, between North America, Africa. An island some 340 miles long, from east to west; and the distance from the north to the south was 230 miles. 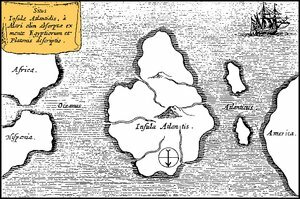 The northern portion of the island had 6 mile high mountains along the shore, with the exception of one mountain which was low on all sides and served as the entrance to the capital city which was also named Atlantis. The south side of the continent just over the mountains was an oblong plain; which is included in the mysteries of ancient history. The island was covered with red, black, and white volcanic rocks which red was the dominate color. The red rocks gave the island a red hue, which also made the island seem most mysterious and eerie. The city of Atlantis was almost as large as the island itself, which was approximately 300 miles in circumference. At the center of the city was a great temple called the Temple of Poseidon. The temple was built on a hill; and since gold and ivory were very abundant the pillars of the main hall were made with gold and the walls was made with silver; the ceiling was made with ivory, which was engraved with gold, silver and copper. All the rest of the rooms were covered with copper from the floors to the ceiling, including the pillars. The great Temple of Poseidon was encircled with 3 motes, which circled the temple; and each mote was wider than the one in the center. Between the motes were 3 circles of land, with the Temple of Poseidon in the center. The walls of around the motes were made with white, red and black rocks which came out of the motes as they were dug. Then the walls were adorned with copper, tin, and brass. Then Atlanteans then build bridges to cross through the continent; drilling tunnels whenever they had to for ships to pass to the center of the island. The second circle of land was used for the citizen’s dwellings. The entire island had both hot and cold springs as the continent sat on caves of volcanic caves. The island was a virtual garden of Eden; with many beautiful and fragrant flowers and plants; including bananas. There were also many different types of animals, which had an enormous amount of elephants; according to mysteries of ancient history stories.